The Raffle was drawn Live on the Stormshadow Guitarworks FB Page on 06/01/19 at 4pm (UK Time). Thanks to all who entered & well done to the winners!! 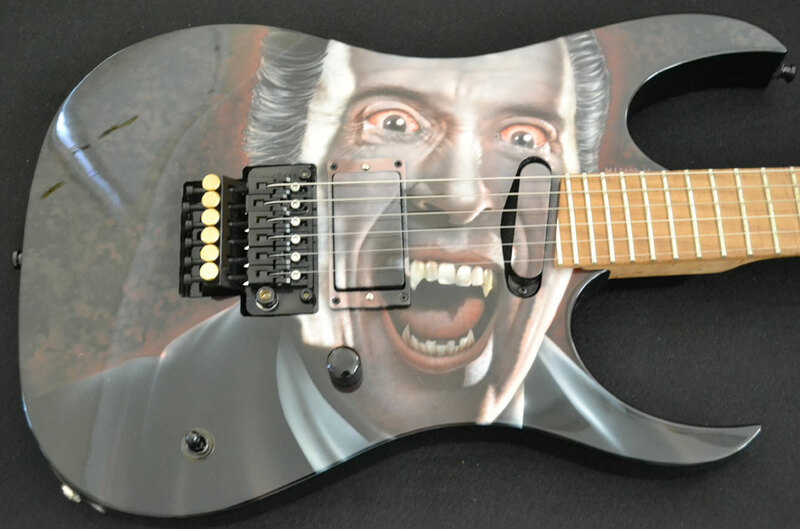 1, With every entry you are purchasing 1 (one) ticket (number to be provided) to win a Stormshadow Guitarworks Custom Shop XII Guitar with Custom Airbrushed Sir Christopher Lee 'Dracula' Graphics by Mike Learn. Serial XII c/s 0008. 2, Tickets are limited to 250 entries to cover the cost of the RRP of the above guitar. 3, There is no limit to the amout of times you can enter, a ticket # will be assigned and provided for every ticket purchased. 4, There is NO cash prize equivilent. 6, The Draw will take place when all 250 Tickets are sold, it will be drawn independantly and on a Live FaceBook Feed. 8, The Winner is responsible for any Taxes/Duties incured on Import. Shipping Isurance is NOT Included. 9, The guitar will be shipped by FedEx or UPS. 10, Collection is available if the winner in UK based. 11, We will also draw a further 4 prizes to win Hats, Tee's (XL) & Beanies which will be shipped FREE Worldwide. 12. All Tickets must be purchased through the Stormshadow Guitarworks website using Paypal. 13. Each ticket is priced at £10.00 GBP ( £9.99 Ticket and £0.01 Shipping ) It's how our site works with shipping!! 14. All Ticket #'s will be allocated in purchase order and drawn at random as stated above. 15, You will be notified of your allocated ticket number to the Paypal Account Email Address. Any entries from the above Countries will be cancelled and monies refunded.